These doughnuts are low in fat as they are baked in the oven instead of deep fried. Good for people on low-colesterol, low fat diets. You will need a mini bundt baking pan with 6 or 12 cavities or a 6 or 12 cavity doughnut baking pan. Preheat oven to 400 degrees F/200 degrees C. Coat cavities of a mini bundt pan or cavities of doughnut pan with nonstick cooking spray or oil. Sprinkle with sugar, shaking out excess. In a mixing bowl, whisk together flour, baking powder, baking soda, salt and cinnamon; set aside. In another bowl, whisk together egg, brown sugar, apple butter, maple syrup, cider, yogurt and oil. Add dry ingredients and stir just until moistened. Divide half the batter among the prepared mini bundt pan cavities or doughnut pan cavities, spooning about 2 generous tbsp. of batter into each cavity. Bake for 10 to 12 minutes, or until the tops spring back when touched lightly. Loosen edges and turn the doughnuts out onto a rack to cool. Clean the mini-bundt pan or doughnut pan, then re-coat it with oil and sugar. Repeat with remaining batter. Makes 12-24 doughnuts, depending on the size pan you are using. These are a fantastic treat for those of us that are on low-fat diets. Perfect for the void the sweet-tooth craves and won't make you feel guilty for eating them. ok, apple cider tastes good. These doughnuts are the perfect alternative to fried ones. And they turn out just as soft and just as fluffy as the real thing. 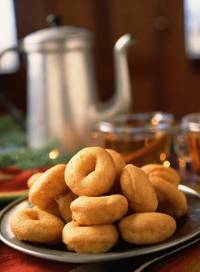 I had tried the other apple cider doughnut recipes that you fry in oil. They all turned out hard and oily. These however where very close to what we have had at orchards. They were delicious and my kids were happy to find one that they enjoyed. I love these donuts and have made probably 12 dozen or so! I make mine vegan with egg replacer and Tofutti sour cream instead of yogurt and everyone LOVES them! These are wonderful, don't even need the sprinkled sugar. I've made them in both regular and mini-doughnut pans. I used Log Cabin Sugar-free syrup and also SF applebutter as that is what I have on hand. Delicious !!! Diana, these were amazing! Moist and delicious, deceptively simple too. Thank you so much for sharing. These are perfect for a quick diabetic snack. They are moist and delicious and very easy to make. Thank you! !